Each Shape consists of 3 different widths to ensure the best possible fit for tension control. This is the same tension set that is in the Kick Start. 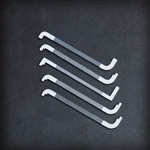 Each Shape consists of 3 different widths to ensure the best possible fit for tension control. This is the same tension set that is in the Expansion Set. 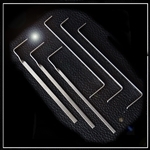 One of the most important elements of lock picking is proper tension. 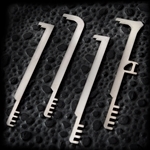 These five flat bar tension tools some with teeth will provide a different style of control and hold that is often needed depending on the style and condition of the lock.